January 28, 2010  At a conference in London, the Afghan president laid out plans to lure Taliban fighters away from the insurgency. 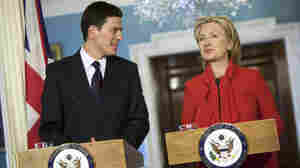 Secretary of State Hillary Clinton and officials from other nations set a timetable to begin shifting security responsibilities to Afghanistan's government in late 2010 or early 2011. January 28, 2010  The U.S. and its allies have agreed to pour in millions of dollars into Yemen but they say the government has to shape up first. That was the core of the message that Secretary of State Hillary Clinton delivered to a meeting in London on Yemen. The group is trying to help stabilize Yemen, which is one of the poorest nations in the Arab world, and is struggling to contain al-Qaida. January 26, 2010  Secretary of State Hillary Clinton travels to London this week to discuss with foreign officials two of Washington's top international priorities. Her first meeting focuses on Yemen, its civil war and its attempts to control al-Qaida. Another round of talks is devoted to tackling corruption and the Taliban in Afghanistan. January 26, 2010  Foreign ministers gathered Monday in Montreal, where they discussed international support for Haiti. They agreed aid will be needed for a long time and countries will have to carefully coordinate their efforts. 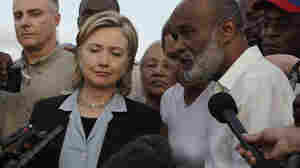 Secretary of State Hillary Clinton said it's important to be "partners with Haiti, not patrons." January 25, 2010  U.S. Secretary of State Hillary Clinton said a daylong conference in Montreal on Monday was "the beginning of a conversation" about Haiti's future. The meeting of diplomats and aid organizations to discuss Haiti's long-term needs will be followed by an international donors conference in New York in March. 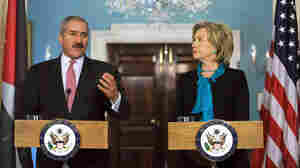 January 21, 2010  Secretary of State Hillary Clinton will meet with her counterparts in Montreal on Monday at a conference of international donors with the aim of "helping Haiti build back better," Clinton said. But experts say the U.S. needs to learn from past mistakes, because American interventions in Haiti often have done more harm than good. January 16, 2010  President Obama held a White House meeting with two former presidents to discuss Haiti as Secretary of State Hillary Clinton led a U.S. team to the devastated island nation. 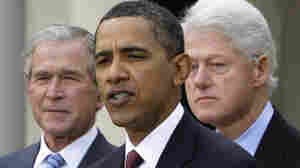 Obama cautioned that the effort "will not be measured in days or weeks; it will be measured in months and years." Earthquake Deals Devastating Blow To U.N.
January 14, 2010  The window to find survivors in the rubble is slowly closing — but there was at least one success story today. An Estonian man was pulled from the collapsed U.N. headquarters. Still, nearly 200 U.N. workers remain unaccounted for, with 36 confirmed dead. The earthquake has dealt a devastating blow to the U.N., which has been a crucial player in helping Haiti overcome its many other troubles. January 14, 2010  Secretary of State Hillary Clinton cut short a trip to Asia to return to Washington to deal with the consequences of this week's earthquake in Haiti. She told reporters in Hawaii before flying home, that the earthquake was a blow for a country that had been on the right track. It also was devastating for the United Nations mission which — up until now — had been a success story. January 13, 2010  Hundreds, if not thousands, of people are feared dead in an earthquake that shattered buildings in Haiti's capital — from the presidential palace to hospitals, schools and the headquarters of the United Nations. President Obama called it a cruel tragedy for the poorest nation in the Western Hemisphere, and he's promising an all-out rescue effort. January 7, 2010  Secretary of State Hillary Clinton swears in a new administrator for the U.S. Agency for International Development Thursday. However, Rajiv Shah's job description is still up in the air. The Obama administration and members of Congress are reviewing U.S. aid programs, and some complain that USAID has been weakened by cut backs, and is now incapable of doing the kind of work that is needed in places like Pakistan and Afghanistan. January 4, 2010  Secretary of State Hillary Clinton said Monday instability in Yemen is a threat to regional and global security. The U.S. Embassy in the country has been closed for two days, as the Obama administration assesses the threats from an al-Qaida affiliate based in Yemen.